The 1950s saw a boom in the popularity of SF movies, beginning with The Thing from Another Planet and The Day the Earth Stood Still in 1951. As with any sudden rise in popularity of a genre in the movie industry, the quality of the output was variable; for every intelligent, thought-provoking piece of work there were probably three dozen cheap rip-offs with few, if any, redeeming features. Despite its pulpy title, It Came from Outer Space, figures as one of the better movies. Although not quite residing amongst the top tier of SF movies, it probably deserves a position high amongst the second tier. 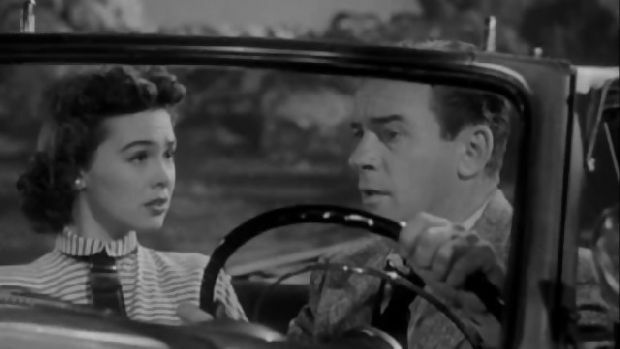 The rather bland Richard Carlson stars as John Puttnam, an amateur astronomer who witnesses the landing of what he assumes to be a meteorite from the balcony of his ranch house where he’s enjoying a little quality time with his girlfriend, Ellen (Barbara Rush). With no little irony Ellen just happens to be reciting ‘Star light, star bright’ when the heavenly body rushes to earth, and the two of them rush over to the site of impact. There they find a huge crater — which, for some unaccountable reason, Ellen finds to be beautiful. Puttnam’s too much of an astronomy geek to resist the opportunity to be the first to examine the object, but when he descends into the crater, he discovers that it wasn’t created by a meteorite but some kind of spaceship. Even more startling is the fact that he sees something moving around through a small doorway just before it slides shut. Unfortunately, the force of this door shutting sets off a mini-landslide which completely buries the ship beneath rocks. A short while later, Matt Warren (Charles Drake), the town’s sheriff, and local newspaper reporter Dave Loring (Alan Dexter) arrive on the scene, and Puttnam’s insistence that there is a spaceship buried beneath the rubble is met with the usual incredulity. Although nothing is stated, it’s clear that Warren and Ellen either have a bit of history together, or Warren is carrying a torch for her — which only serves to fuel his scepticism of Puttnam’s claims. Unable to persuade the sheriff and newspaperman that he isn’t losing his mind, Puttnam drives back to town with Ellen, but on the way they nearly run into a strange creature. However, the creature appears to have vanished when Puttnam pulls over to see what it was. The following morning, Puttnam and Ellen return to the scene, which has now been cordoned off, only to be greeted by a couple of national reporters whose curiosity has been piqued by Loring’s less than helpful ‘Star Gazer Sees Martians’ headline in the local paper. The site is being surveyed by a scientist named Snell (George Eldredge), but as there is no radioactivity recorded at the site, he is as sceptical as everyone else. Increasingly frustrated, Puttnam heads back to town with Ellen, stopping on the way to ask a couple of telephone engineers, Frank (Joe Sawyer) and George (Russell Johnson) whether they’ve seen anything out of the ordinary. They haven’t — but they’re going to. Driving back to town, they narrowly avoid hitting the creature, and when George stumbles from the cab he finds himself engulfed by it. With a strange sixth sense possessed only by characters in movies struggling to find a means to have something done in order to drive the plot forward, Puttnam has a strange feeling that something has happened to the two engineers and turns back. Finding their deserted truck, Puttnam and Ellen search the nearby area and eventually stumble upon George. He appears unharmed, but is acting strangely and stares directly at the sun for a number of seconds without blinking. Frank is nowhere to be seen — although the audience are shown one arm in the sand, protruding from behind a boulder. Puttnam’s sixth sense kicks in once again — although this time it fails him — and, believing that Frank is dead, he heads back to town to fetch the sheriff. Of course, Frank and George and their truck are nowhere to be seen when Warren reluctantly accompanies them back to the site where they were. In fact, when a deflated Puttnam returns to town he sees the two engineers carrying supplies they have purchased. When Puttnam follows them down an alleyway, the two men confront him. It turns out that these guys aren’t really Frank and George but are a couple of aliens disguised as the two engineers so that they can move amongst the townsfolk without being noticed. Their ship has crash landed and they need a few items to get the thing moving again, and once they’ve done this the real Frank and George will be released. Puttnam now has to decide whether to trust that these aliens are telling the truth — or whether they have more sinister intentions. Truth be told, the aliens in It Came from Outer Space are easily the least convincing aspect of the entire movie. They’re only briefly glimpsed, but what we do see of them is quite laughable by today’s standards. It was important for the storyline and underlying theme of tolerance that the aliens appeared to be as repulsive as possible, but it doesn’t look like much thought has gone into how they look. Many SF movies of the 1950s seemed to give little thought to how their the look and functionality of their aliens was completely at odds to their technological achievements, but It Came from Outer Space at least has its aliens capable of assuming other forms. They just look so primitive in their normal form that it’s impossible to imagine them possessing the intelligence to create crafts capable of travelling millions of miles. They also seem to suffer from tunnel vision despite having one giant eye sitting above a small beak. The movie’s theme of the importance of tolerance towards those who are different to us, or whom we fail to understand, is explored quite intelligently, with Charles Drake’s sheriff providing the counter-argument to Carlson’s enlightened man of the skies. Many movies would have gone for extremes, pitting Puttnam against a torch-wielding crowd of locals intent on destroying whatever it is they find in the ship, but It Came from Outer Space employs a more subtle tack of having to contend with an institutionalised propensity to consider attack as the best form of defence. Despite his soft spot for Ellen — and corresponding dislike for Puttnam — Warren is more reasoning than a mindless mob, and his overriding motivation is always the protection of the townsfolk irrespective of his personal enmity towards Puttnam. Such a balanced outlook in a movie’s figure of conflict is a rarity in any movie, let alone an SF B-movie made in the 1950s.